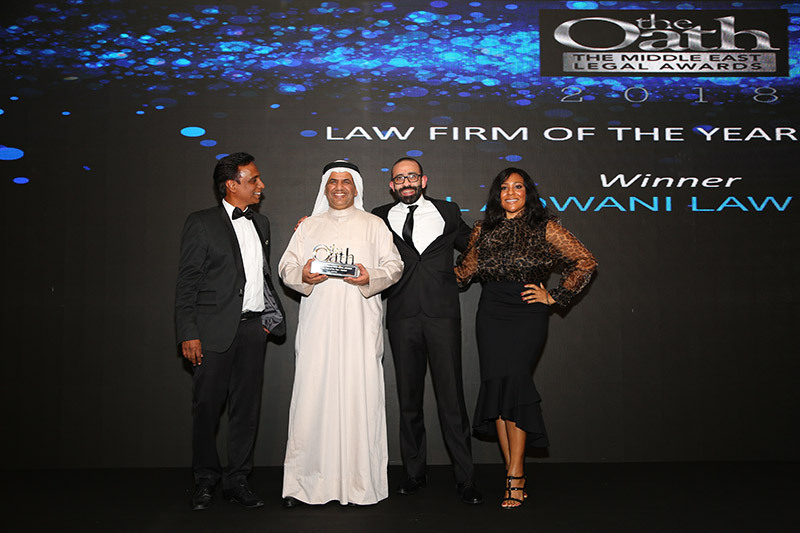 Dubai— Al Adwani Law Firm is pleased to announce that the Firm has been named 'Law Firm of the Year - Kuwait' by The Oath Middle East Legal Awards. This is the first time the Firm has taken home the award; however, this is the second consecutive year that the Firm was nominated. The awards ceremony took place in Dubai on December 5, 2018 at the Westin Dubai Mina Seyahi Beach Resort & Marina, with over 300 legal professionals in attendance. Established in 2015, The Oath Middle East Legal Awards recognizes law firms, general counsel and in-house teams who are industry leaders transforming the Middle East with their outstanding contributions. Al Adwani is one of the largest law firms in Kuwait, delivering quality and value to clients locally and around the globe. Established in 2007, with the objective to offer legal services to local and international clients through a unique approach, different from the prevailing norms in the legal profession. The Firm has a diverse group of committed legal professionals with vast experience, incorporating multi lingual and multi cultured talents and resources to deliver effective and integrated solutions in various areas of the local and international laws. www.aladwanilawfirm.com.